For added convenience, we are pleased to offer as an additional rental option our Professional Uniformed Restroom Attendant with your GARDEN HEAD portable toilet rental. Professional Uniformed Portable Restroom Attendants are available to maintain cleanliness of this luxury portable toilet rental during your special event so you don't have to. Our trained professional portable restroom attendant will clean your porta potty rental/s after each user to ensure every guest is guaranteed a clean visit to the GARDEN HEAD portable restroom. 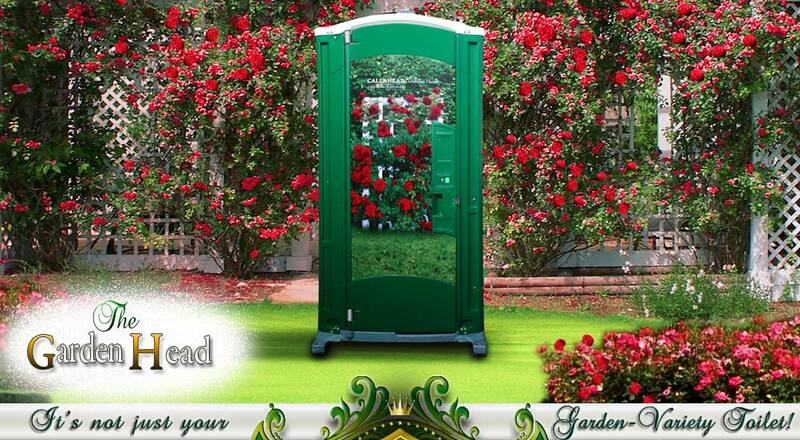 The GARDEN HEAD is another CALLAHEAD designed one-of-a-kind porta potty rental for your special event. 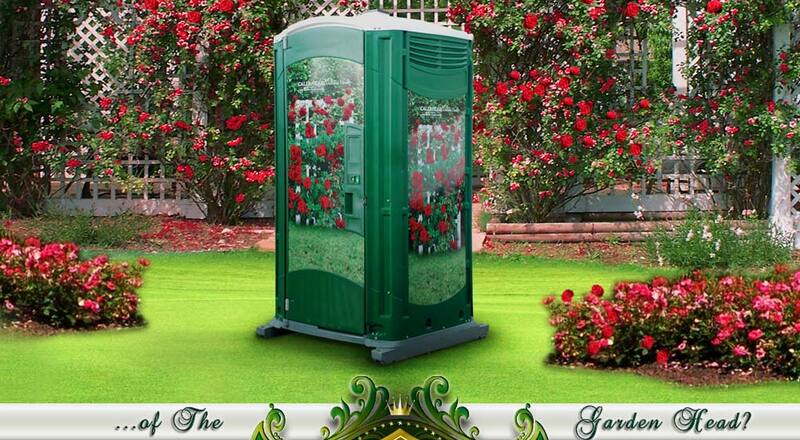 Our GARDEN HEAD is a portable restroom that will add to the décor of your party or special event. You will have the look of a beautiful garden of red roses on a trellis with vibrant green hedges that will definitely make a lasting impression to your guests. This is a VIP port a potty that operates as a full service portable bathroom that will astonish your family and friends. Once you have a CALLAHEAD designed portable toilet rented for your party you will never rent a regular porta potty again. The GARDEN HEAD is a great rental for every special event including, house parties, backyard barbeques, outdoor wedding receptions and ceremonies, baptisms, bat mitzvahs and bar mitzvahs, graduation parties, bridal and baby showers, bachelorette parties and any birthday party in need of portable toilets. The CALLAHEAD GARDEN HEAD rental comes with all the bells and whistles required for a pleasant trip to the restroom too. 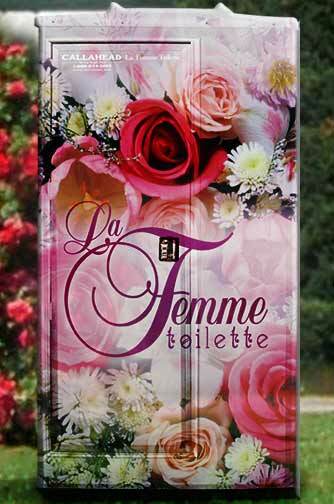 It has a full flushing toilet with a hand operated flushing handle that is easy to use. A closed cavity tank will keep waste out of sight and eliminate foul odors inside the portapotty for your guests. A separate non splash urinal inside the portable toilet will keep the portable restroom more sanitary and be very appreciated by the women at your event. The GARDEN HEAD's full service sink has a foot operated pump for hands free operation for greater sanitary hand washing. CALLAHEAD's soap dispenser is installed above the sink filled with our antibacterial soap that kills 99.9% of germs and bacteria. Standard with the GARDEN HEAD rental is CALLAHEAD's HEADLINER toilet seat covers so every guest is ensured of a clean dry sanitary seat when using the porta potty. Another extra installed is our HEADMIST automatic air freshener dispenser that will release a continuous clean fresh scent so that every user has a pleasant trip to the portable restroom. 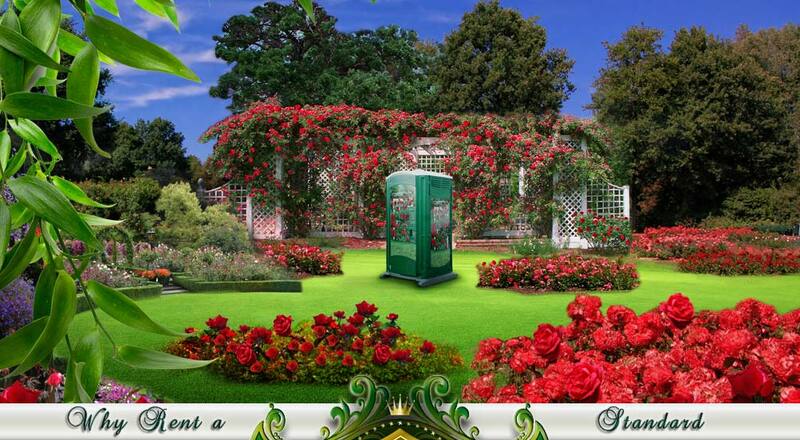 An additional accessory to add to the beauty of this portable toilet is our floral arrangement mounted inside the port a pottie at no extra charge to you. Dual roll cover toilet paper dispenser, coat and hat hook, convenience shelf and lockable door with occupancy sign to ensure privacy make this a premium special event port a potty rental. This porta potty's interior is completely ventilated with floor and ceiling vents for excellent air circulation. The GARDEN HEAD's white translucent roof adds bright natural light during the day. A solar powered light brings excellent lighting inside the porta potty for evening and nighttime use so no electrical hook ups are required. Throughout New York's five boroughs of Queens, Brooklyn, Staten Island, Manhattan and the Bronx as well as Nassau and Suffolk Counties on Long Island and Westchester County in New York express high demand for CALLAHEAD's VIP and designer portable toilets. 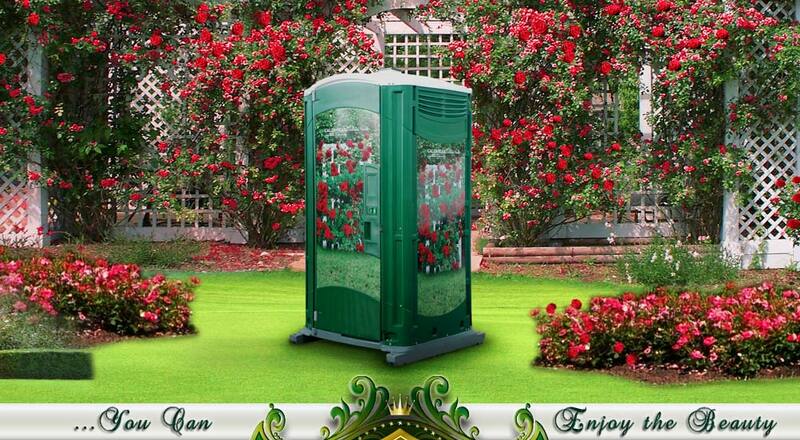 Our one-of-a-kind designed porta potty's are the most sought after special event portable toilet rentals in New York. CALLAHEAD is the only company to provide these beautiful artistic porta potties that will be the talk of your special event. The best of all, they are the most sanitary and best quality port a potties rentals available anywhere. The GARDEN HEAD is available for same day delivery throughout Nassau and Suffolk County, New York City's 5 boroughs of Manhattan, Queens, Bronx, Brooklyn and Staten Island as well as all of Westchester County. 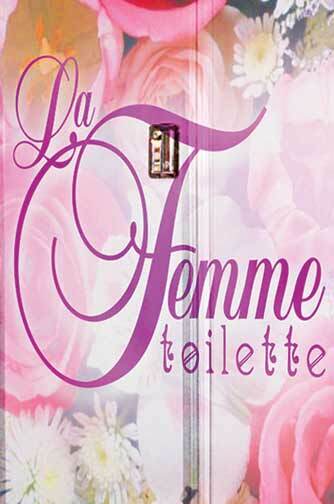 Don't compromise on clean and sanitary restroom facilities for your family and friends. Provide them with the best in the portable sanitation equipment in the country, CALLAHEAD to help make your event a great memory. 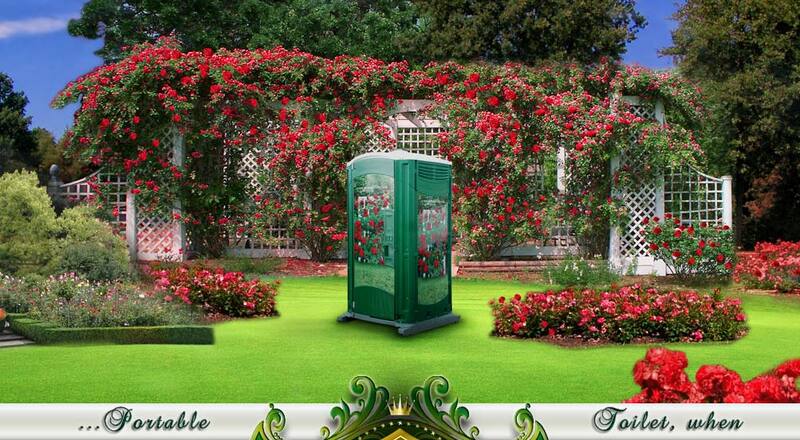 The following is a list of special events where the GARDEN HEAD luxury porta potty is most commonly rented. However, this portable toilet is an ideal rental for just about any outdoor special event, indoor special events with limited restroom facilities or public locations where portable restroom facilities are needed.